Today, I arrived in Bristol with a limited window of opportunity. After spending the weekend together in Bath, M&A were kind enough to indulge in my ancestral forays, which is good because they brought a crucial element (besides good humor and companionship). And while getting around England is feasibly done via public transportation, there isn’t a single route that specifically serves the regional circle of cemeteries. Yet while M&A were more than willing to muck with me amongst the graves, they had to get themselves back to London that night. The work day beckoned. In the spirit of spontaneity, my itinerary was not set in stone; I rolled into Bristol without securing a place to rest my head for the night. This would irk most international travelers, however I was less concerned with comfort than with bagging as much ancestral research as possible. That meant I had about thirty-six hours to find my great-great-great-grandfather’s grave and raid the public record office. 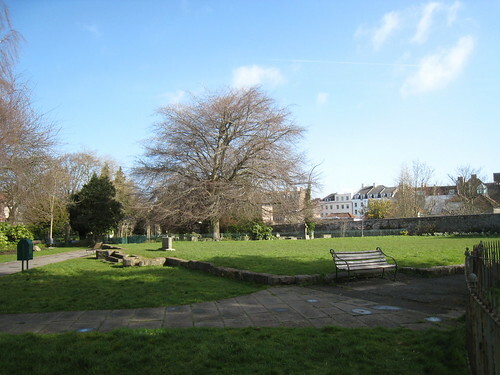 My remote aerial surveillance (Google maps) paid off ten-fold – we rolled up to St Andrews churchyard with no issue. It didn’t hurt that M&A had a TomTom GPS unit for their car. How any human could navigate England’s nonsensical roads without one was beyond baffling. The cemetery was exactly as I expected: long and narrow with a massive square void on one end – the grassy footprint of the church that once stood there. With three members in our search party, we could easily scour every grave within an hour. There was just one glaring complication – half of the graves were illegible, their faces completely stripped by erosion, the fragile stone chipped away by natural forces. Even if ATEV’s grave was nearby, there was a strong chance we’d never find it. We systematically read each and every stone, often brushing away wet leaves and peeling off moss. Some tombstones were spread apart from one another; others were packed together, neatly and tightly. As a Vice Admiral when he died, surely ATEV’s headstone would be a little nicer, perhaps with some military décor. A few of the nicer, in-tact graves fit this description, yet after an hour of searching each and every grave, from Clifton Hill road to the Fosseway, there was no sign of a Vidal. To think this grave, so significant to my heritage, would disappear with the fragility of stone was heartbreaking. Disappointed but not ready to surrender, hunger hindered my desire to keep searching. The lunch hour was waning and low blood-sugar was getting the best of us. Over an unpleasant lunch down by the @Bristol complex, I phoned local hotels in the hopes of finding a well-situated and reasonably-priced inn for the night. Considering the last-minute, almost desperate nature of my inquiries, I succeeded in finding one near Clifton and the university, making it feasible to explore the last known whereabouts of the Admiral. As awkward culinary creations digested in our stomachs, we scurried up to my newfound hotel in Tyndalls Park, then ventured over Sion Hill in Clifton. Address in hand, there was no difficulty in finding the Admiral’s last residence. 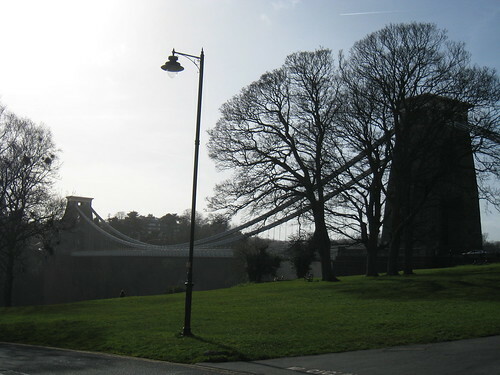 It vividly fit my expectations – a handsome row of townhouses which faced the short but impressive Clifton Suspension Bridge, and overlooked the deep Avon Gorge. Chilly spring air blew across the tree-lined park as history came alive in my mind. With only a handful of facts, I tried to imagine the old man during his final days. Had there been more time, I would have fearlessly knocked on the door of 13 Sion Hill in hopes of a tour. The remaining hours of the day allowed for a sight-seeing jaunt down to Cheddar and Wells, where we snacked on authentic cheese and local beers, respectively. My chauffeurs had me back in Bristol by evening, with enough time to dine and recline, while they continued on to the capitol city. 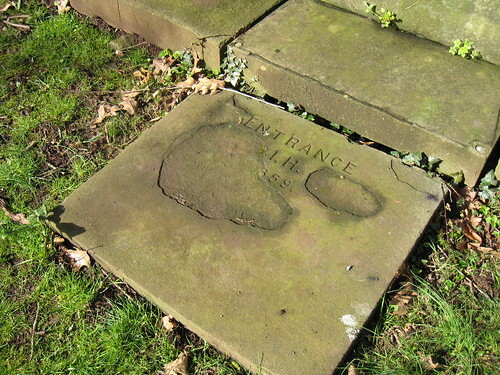 As I sit in a pub, scribbling in my Moleskine, reflecting on the day’s events over a pint (or two), I’m not giving up hope that this grave can be found. Only tomorrow will tell.